Sasha invites you to a fairy tale and fantasy land. 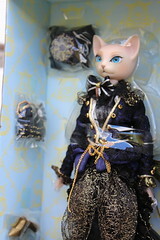 Sasha are 1/6 dolls that come with either a rabbit or cat head depending on the model. Sasha dolls are made by Groove, the same company that makes Pullips. 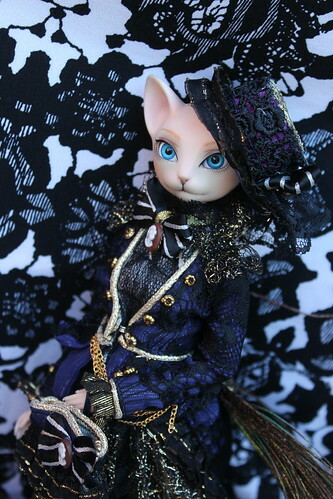 They are somewhat similar in style to Groove’s other 1/6 fashion line Jdolls but focus on more fantastic clothing, they also share inset doll eyes but both lack an eye mechanism for movement. 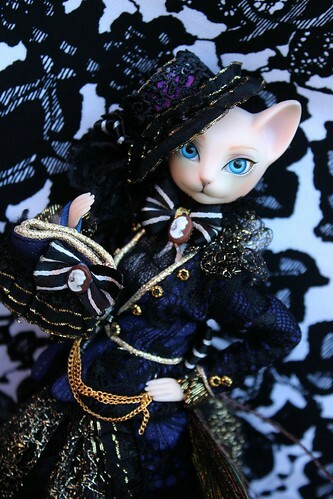 They say curiosity killed the cat, I’ve been very curious about Sasha for a while unfortunately her price even at Pullipstyle who is renowned for their reasonable prices on Pullips and other Groove dolls was quite high at $115 (and they were the cheapest). Curious or not, I couldn’t quite justify spending quite that much an unknown doll thankfully the price for Sashas has been recently been reduced to a much more affordable $89.95. Lumina was inspired by the star’s light. She was released in February of 2013. Unlike Pullip, Sasha seems to have an infrequent release schedule the first two were released in January of 2012 and the rest have been sporadically released. 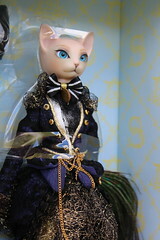 As of this writing eight different Sasha dolls have been released so far (four cat type models as well as four rabbit type models). Lumina’s stock is actually pretty neat as some of the elements are detachable so they is a degree of choice about how dressed up you would like her to be. She also came with shoes, a purse and a hat. 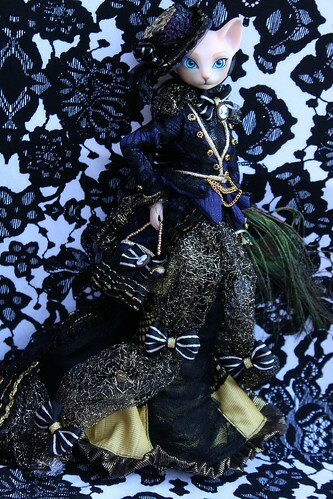 comes with the same type of plastic stand that Pullip comes with, Lumina’s with black with like gold sparkles. My only minor complaint is the shoes are a bit plain (they are gold colored heels) but she has such a long dress anyway that even if they were super amazing shoes you wouldn’t really be able to see them. 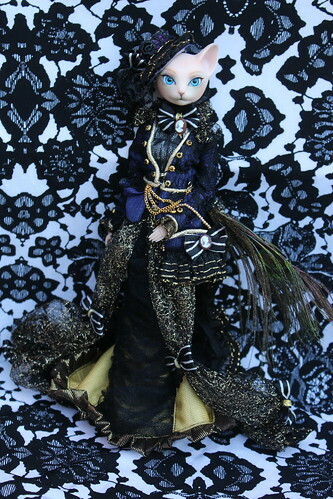 As I mentioned before Sasha come with doll eyes, I find Lumina’s to be quite striking. 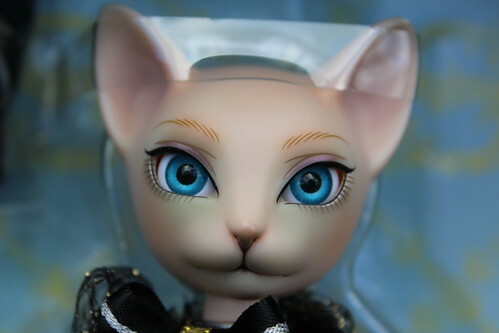 In theory, if you didn’t like the eyes you could swap them out with a similarly sized set of bjd eyes but I’m admittedly a bit of a scaredy cat (ha!) when it comes to customizing or opening up doll heads unless I absolutely have to. Due to her skin tone she reminds me quite a bit of Sphynx which are a breed of hairless cats. I’ve taken to calling her the Duchess Sphynx due to her resemblance to the breed as well as her being quite a lady. 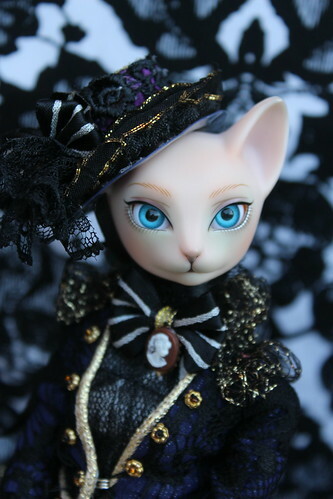 Lumina looks quite regal and elegant in her gold and navy ensemble with touches of black and white to offset it with just a splash of purple for the hat. This is my favorite picture of her that I have taken so far, something about the tilt of her head makes her expression look somewhat inquisitive or curious herself. The back and side view of Lumina’s dress is actually pretty intricate and cool looking so I couldn’t resist taking a picture of the lovely view. Here is Lumina looking slightly less formal with some of her detachable stock pieces removed. Lumina really is the cat’s meow! 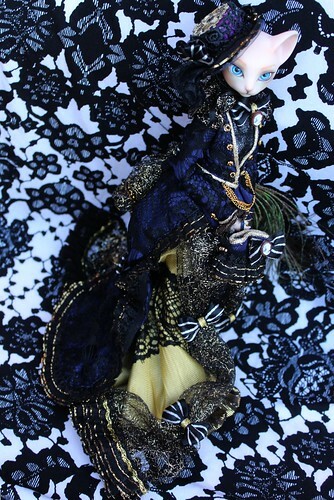 Additional photos of Lumina are available on my flickr here, feel free to make requests for more photos (comparisons etc) as I’m aware there aren’t too many photos of these dolls around just yet. 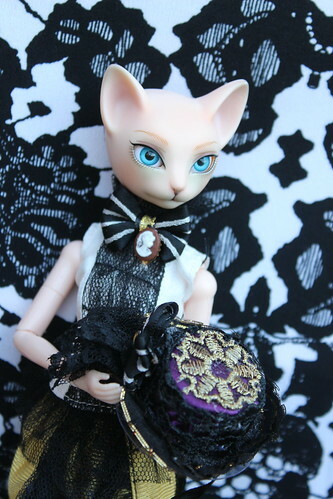 I will be making another post with comparison pictures as well as some additional pictures of Lumina (and her companion Pippin) redressed in some decidedly less formal clothing. 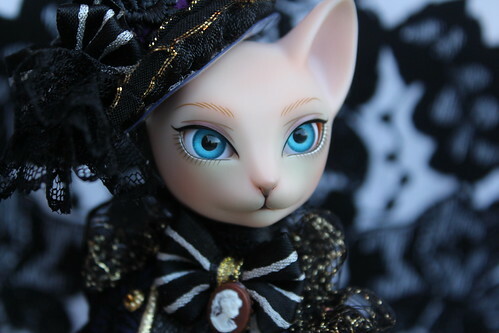 Remember you can get your own kitty or bunny from Pullipstyle. 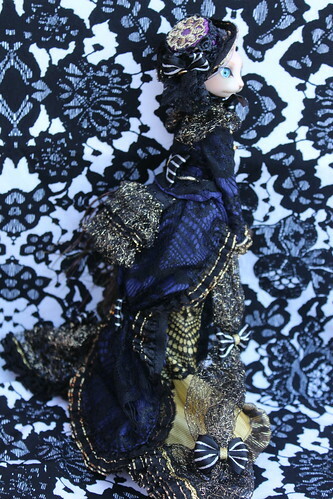 This entry was posted in Doll and tagged groove, lumina, Pullip, sasha. Bookmark the permalink.